■Replacing light bulbs ●Turn off the lights. Do not attempt to replace the bulb immediately after turning off the lights. ●Do not touch the glass portion of the light bulb with bare hands. Hold the bulb by the plastic or metal portion. If the bulb is scratched or dropped, it may blow out or crack. ●Fully install light bulbs and any parts used to secure them. Failure to do so may result in heat damage, fire, or water entering the headlight unit. This may damage the headlights or cause condensation to build up on the lens. ●Vehicles with discharge headlights: While the low beam headlights are turned on, and for a short time after they have been turned off, metal components at the rear of the headlight assembly will be extremely hot. To prevent burns, do not touch these metal components until you are certain they have cooled down. ■Discharge headlights (if equipped) ●Contact your Toyota dealer before replacing the discharge headlights (including light bulbs). ●Do not touch the discharge headlight’s high voltage socket when the headlights are turned on. 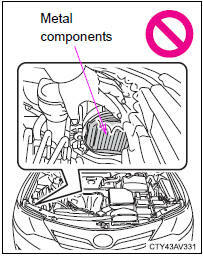 ●Do not attempt to take apart or repair the low beam discharge headlight bulbs, connectors, power supply circuits, or related components. ■To prevent damage or fire Make sure bulbs are fully seated and locked.